Although I prefer leaving vegetation in our old-vine vineyards and keeping it low to maintain a fresher, cooler soil in the summer, we are unfortunately obliged to wheel the grass under the soil in our most exposed and remote vineyards to avoid them from being devastated by bush fires over the summer period. This has little to do with agriculture but more with survival as it is an unfortunate reality in the southern parts of Italy and Europe. 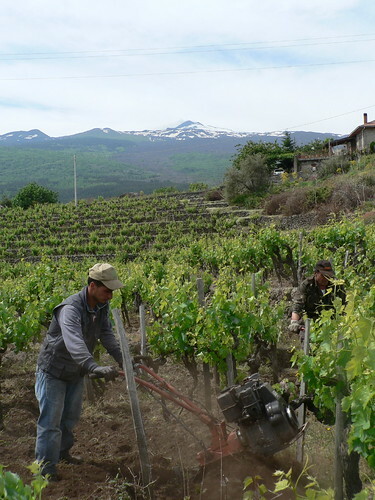 Over the winter, in the initial part of the growing season, we had lots of rain, snow and hail (very low crop in the contradas Porcaria and Barbabecchi) and vegetation started late this season. This helped us in reducing the work with the “motozappa” to one passage only in our exposed vineyards. We did have a lot of work cutting the grass which in the end is also beneficial as the bio-mass helps to regenerate the organic layer, decomposing over the autumn and winter season. This entry was posted on Wednesday, May 23rd, 2012 at 1:15 pm	and is filed under Work in Progress. You can follow any responses to this entry through the RSS 2.0 feed. Both comments and pings are currently closed.